Joseph Silverstein is an American violinist, conductor, and teacher born on March 21, 1932 (Heifetz was 31 years old.) He is best known for being a long-time concertmaster of the Boston Symphony and Conductor Laureate of the Utah Symphony (as of 1998.) At an early age, he began his violin studies with his father but eventually entered the Curtis Institute of Music (Philadelphia) where he studied with Efrem Zimbalist, Josef Gingold, Mischa Mischakoff, and William Primrose, among others. 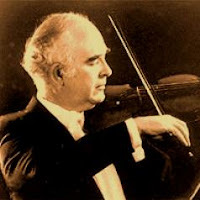 Prior to joining the Boston Symphony in 1955, he was a violinist in the orchestras of Houston (1950), Philadelphia (1952 - 8th desk), and Denver (1953). He became concertmaster of the Boston Symphony in 1962 (after Richard Burgin) and served in that capacity until 1984. He was also assistant conductor of the BSO from 1971 until 1984. He was appointed conductor of the Utah Symphony in 1983 and was there until 1998. From 1987 to 1989, he was Music Director of the Chautauqua Symphony as well. He also conducted the Florida Orchestra from 2001 until 2003. Along the way, he has conducted and recorded (for Telarc, RCA, CBS, Nonesuch, DG, Pro Arte, etc.) with a large number of orchestras worldwide. Silverstein has taught at the Curtis Institute, Yale University, Boston University, and the New England Conservatory. He plays a 1742 Guarnerius. Silverstein's 1742 Guarnerius is a Del Jesu - top of the line.